Dallas Cowboys: Dez Bryant Threatens to Sit Out Games | NFL News, as it happens, when it happens. Your one stop shop. With the deadline to sign a multiyear deal looming, Cowboys wide receiver Dez Bryant tried to heighten the stakes today, threatening to sit out training camp and regular season games if he and the Cowboys are unable to reach a long-term deal. Dez tweeted out today, “As much as I love football…on my beautiful babies… I apologize #cowboynation but I will not be there if no deal #fact” The tweet came after Bryant reportedly informed Stephen Jones, the son of Jerry Jones (who we all know is actually the one running the team and deserves a lot of credit for the Cowboys recent success) of this information. Stephen Jones denied that Dez had told him that. The deadline for signing a multiyear franchise deal is 4 p.m. eastern on Wednesday, July 15. If Bryant doesn’t sign by then, he will receive a $12.8 million salary this upcoming season if he agrees to sign the one-year franchise tender. The Cowboys love Dez Bryant, and consider him their best offensive player. They’d like to lock him up long term, but they don’t want to overpay him. Much of the Cowboy’s success last season came from the league’s best offensive line, and they want to keep that group together for a long time. They signed left tackle Tyron Smith to a big contract last summer, and they want to lock up right guard Zack Martin in the upcoming years. In a salary cap league, they won’t be able to do that if they overpay for Dez. The Cowboys believe Bryant’s threat to be a bluff. While Dez has had all kinds of off the field and on the field issues with his maturity, the one thing that can’t be denied is that Dez loves football, and he loves his team. Even during OTAs and minicamp, while Bryant was still negotiating with the team, he couldn’t keep himself away, participating in individual drills, and being on the sideline watching when his contract situation didn’t allow him to participate. Because of this, the Cowboys aren’t worried about Dez’s threat, and are confident number 88 will be on the field in uniform week 1 against the Giants. Dez Bryant has established himself as one of the top receivers in football. He’s a part of an elite group that includes Antonio Brown, Demariyus Thomas, Calvin Johnson, Julio Jones, A.J. Green, and Jordy Nelson. However, Dez has now played in the league for five years, and it wasn’t until last year that he played in his first playoff game. 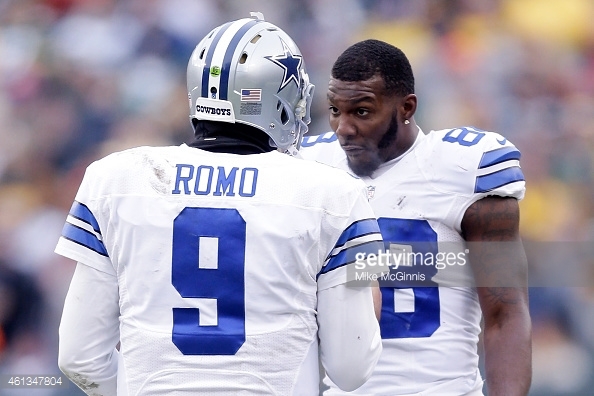 While Bryant had an impressive season, the real secret to the Cowboy’s success in 2014 was due to their much-improved offensive line and their ability to get consistent quarterback play out of Tony Romo for the entire season. If you look at the receivers listed above, their production is based almost entirely on their quarterback’s effectiveness. Demariyus Thomas wasn’t a top tier receiver with Tim Tebow, but he is with Peyton Manning. A.J. Green is a lot better with regular season Andy Dalton than playoff Andy Dalton, who we all know are two different quarterbacks. In Super Bowl XLIX, the best wide receiver in the game was 5’10 college quarterback Julian Edelman. Yet, there were receivers on both teams making tremendous plays. The point of all of this is that there are plenty of good wide receivers in the NFL, and the fact is a good quarterback will be good with just about any of them. Dez Bryant is incredible, but his value to the Cowboys is nowhere near enough to sacrifice their young offensive line down the road. However, deadlines always seem to make both sides think a little more reasonable, and it won’t surprise anyone if by time 4 pm passes on Wednesday, Dez Bryant will have a new long-term contract with the Dallas Cowboys.